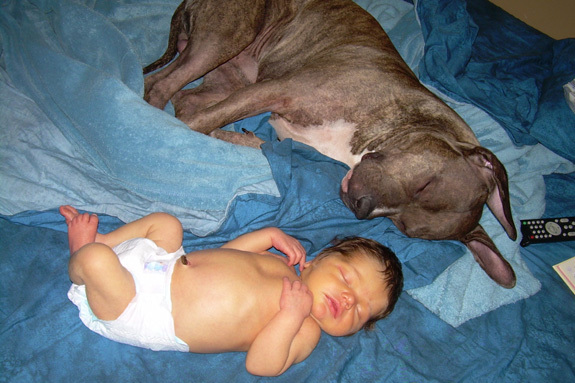 We have our wonderful pit bull due to unfortunate reasons: My husband and I were married three years ago, and the next morning our 5-year-old pit bull, Dozer, died. He had somehow gotten rat poison into his system. We managed to get by with a quiet house for about six weeks before we met a puppy we named Bane. As soon as we saw the little brindle ball of fat, we were in love. Bane really helped fill the void in our life. He grew and grew … and chewed and chewed! 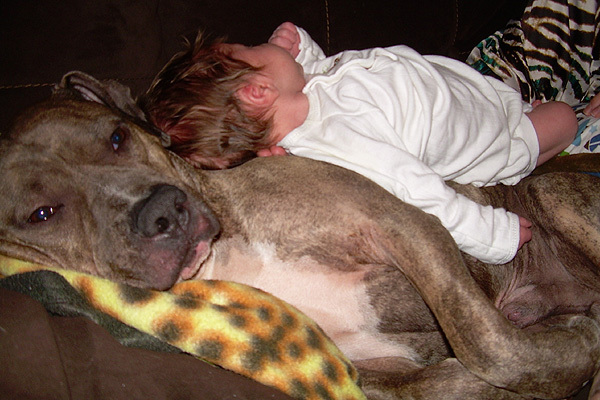 We took him everywhere with us, and he changed a number of people’s opinions about pit bulls. He was the center of attention for two years… then we were expecting our first “real” child. While I was pregnant, friends and family members who hadn’t met him asked what we were going to do with Bane when the baby arrived. 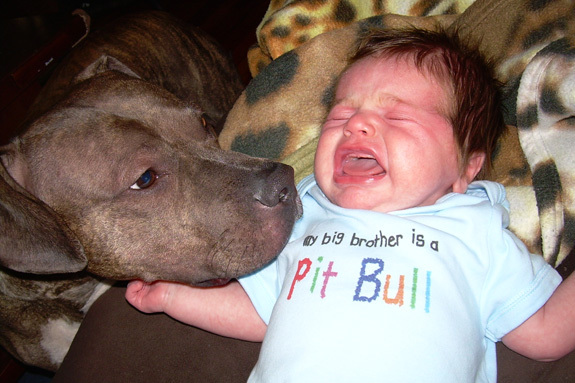 I would first ask them if they had ever even met a pit bull, and, of course, they had not. Did they know they are also known as the “nanny dog”? Nope. Ever seen Petey on “The Little Rascals”? 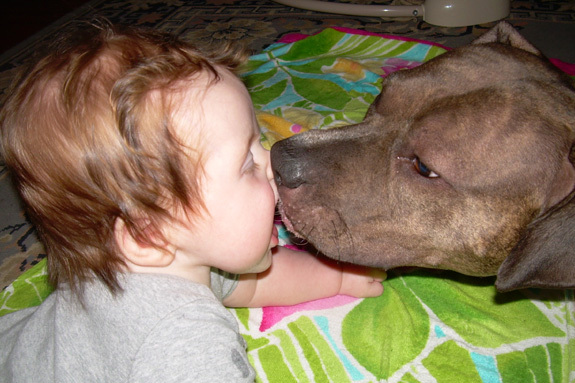 That’s a pit bull! Bane and the baby actually played their own weird games while the baby was in utero. Bane would squeak a toy, and baby would kick. If he tried to rest his head on my belly, he’d get kicked or punched, then he’d nose gently at my belly just to see if the baby could hit him again! When our newborn son, Ben, and I came home from the hospital, the only thing we worried about was Bane stepping on him. The only issue we had during the first few months was the fact that Bane was not getting as much attention! When the baby cried, Bane would actually shake because I would have to stop playing with him, and he assumed he had done something wrong. This soon passed with the help of extra treats and special “mommy and Bane” time. Ben and Bane became best friends quickly. They play their own version of tag, where Bane runs about the room squeaking his toy and then waits while Ben crawls after him. Then when Ben’s about to get him, Bane darts around him (or jumps over him), and on and on they play. They’ve even learned from each other. Bane learned a new trick: If he makes Ben laugh while eating, food gets thrown around and he gets to “clean up.” Ben in his mimicking of Bane found that Nylabones and socks are very good for teething! When anyone that Bane doesn’t know comes to the house, or even nearby if we’re in the yard, he sits between Ben and the stranger until we tell him they’re OK. When I’m trying to put Ben to bed, Bane will lie down next to him to cuddle and help him fall asleep. The only way he’d be a more perfect big brother is if I could train him to change diapers! While obviously I still wish we had Dozer in our lives, I can’t imagine my world without Bane. He is so good with the baby, and I love sharing their relationship with others. I especially appreciate how after long days he still loves to curl up with me … though he no longer sleeps on my legs so that I can get up without disturbing him when the baby cries! @theprettychic Isn’t that a sweet photo, we love Ben’s onesie too! @StubbyDog @theprettychic. Both photos are adorable. I love that last photo! Bane is so handsome. What a lucky family, in many ways! @StubbyDog @annedreshfield Don’t I know it! 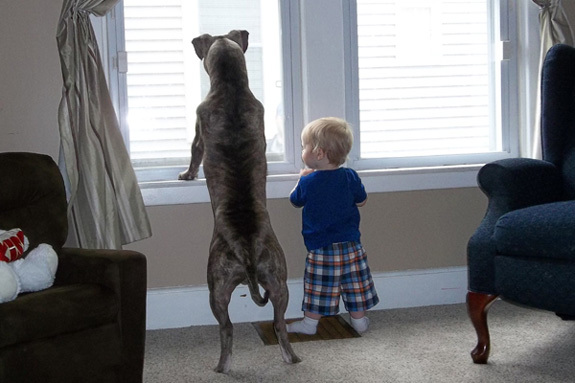 “My big brother is a Pit Bull!” That says it all. @millermorgan We know, isn’t that shirt just the greatest! I love all these photos!!! You sure can tell that Bane and Ben have a special bond!!! Beautiful family!!!! @lilpenny_21 Thanks, it’s such a sweet story, we loved bringing it to our fans. My husband and I are expecting our first child and have two pitties. People ask me all the time if I’m nervous about the dogs and the baby or if I’d get rid of the dogs after the baby comes. I tell them I’m not nervous at all–my pups will be great big sisters, and we’ll have our own story like this. Thanks for posting it. @heidischick Congrats on expecting your first child, and please send us your story sometime after the baby arrives. Just send to [email protected] with photos of course. These pictures are so precious! Your two “kids” are so perfect together! Good luck to you and your very cool family!